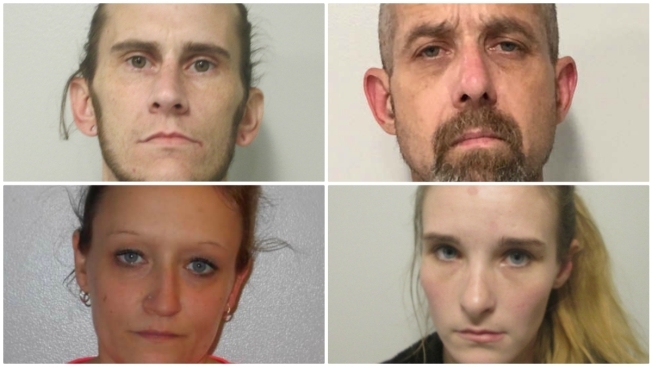 Clockwise, from top left, Joseph Henriksen, Paul LaCourse, Allyson Graham and Jennifer Karl are facing a variety of charges following their arrests on Wednesday. Four people are facing drug and weapons charges after local police and a state police SWAT team converged on a Bow, New Hampshire home following a months-long investigation. Bow police and state police said they executed a search warrant at 3 Branch Londonderry Turnpike West on Wednesday. The suspects initially did not want to surrender, but after a short time, three of them exited. A fourth suspect remained inside and ultimately surrendered 45 minutes later after negotiating with police. Paul LaCourse, 50, of Bow, was arrested on possession of a controlled drug and felon in possession of a deadly weapon charges. His bail was set at $10,000. Joseph Henriksen, 33, of Warner, was arrested on a warrant for sale of a controlled drug. His bail was set at $50,000. Jennifer Karl, 35, of Belmont, was arrested on a warrant for transporting drugs in a motor vehicle and breach of bail. Her bail was set at $5,000. Allyson Graham, 23, of Manchester, was arrested for breach of bail. Her bail was set at $2,000. All four suspects are being held at the Merrimack County House of Corrections, according to police. A large number of firearms, knives and narcotics were seized, and police said additional charges will be forthcoming. Assisting in the investigation were Allenstown police, the Merrimack County Sheriff's Office and the Bow Fire Department.